Very nice and makes SquareWear truly wearable 🙂 The add-on module in the picture is an ADXL335 accelerometer which takes analog pins A4, A2 and A3. The 3D files can be downloaded from Thingiverse. Thanks Paul for designing this case! 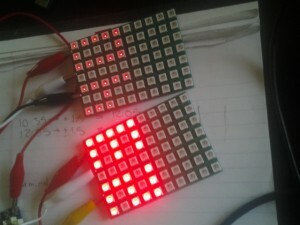 I also got an email from Pete Metcalfe who wrote a temperature display demo using SquareWear 2 and the chainable LED matrix. He made a compact display by creating a new, 3×5 pixel array of numbers. The source code is posted below. I am so glad to see SquareWear 2.0 being gradually picked up by the community, and the interesting applications created and shared by users. More to come later!